Welcome home to the gated community of Seminole Lakes! With 3 Bedrooms, 2 Full baths and an oversized 2-car attached garage, this popular great room plan is waiting for you! Built strong and maintained well since 2002, this home is located on an oversized corner lot! Features include a screened front entryway with decorative cut-glass door, full window storm protection, a 20’x17’ covered/screened lanai with access from the great room and master bedroom. Freshly painted inside and out and new luxury vinyl flooring and baseboards throughout (2019), new Stainless kitchen appliances and water heater (2019) and a newer A/C System (2015). 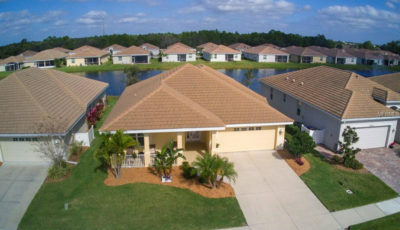 With just shy of 500 single-family homes, Seminole Lakes is a fully developed golf and tennis community located just four miles south of historic downtown Punta Gorda / Charlotte Harbor, Florida. Considered “maintenance free,” the low monthly fees include lawn care, gated security, a community pool, and tennis courts. The fee also includes community road and lake maintenance. Individual homeowners are responsible for their home and shrubbery care. The community features include eight freshwater lakes, the largest of which is nearly 25 acres, and access to the Seminole Lakes Golf Club, which is a semi-private 18-hole executive course. From this home, you are .4 miles from the community pool, 1 mile from shopping, 2.5 miles from Interstate 75 and just 5 miles from historic downtown Punta Gorda.